This is my first time reading a book in this series of early chapter books targeted for seven to ten year old readers but a delightful read for any age. The Book of Wishes of Wishes only reveals its contents to those to wish to leave their normal world. Magic is unlocked by reading the wish aloud three times and then opening up the book This book travels from library to library seeking a child who needs it. Holly is a nine year old fourth grader who has recently moved from Texas to Montana. On Christmas Eve, she is thinking about how much she misses her friends and former life. Her only comfort is her fairy doll named Cora. In an attempt to cheer her up, Holly’s mom takes her to visit Santa. Holly confides that she wants a baby sister, a horse, and her friends back. Knowing that this is a tall order, Santa tells her about a magic book in the library. He warns her that not everyone gets what they wish for and that there is a price to pay. Holly races to the library, and to her surprise, the Book of Wishes finds her. 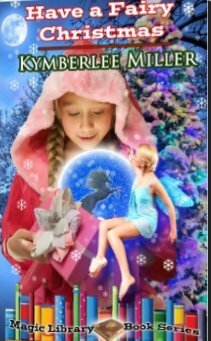 Holly will take an unforgettable journey to Fairy Land, but she learns that once she goes back home she can never return. Will Holly leave her family to live in a Fairy wonderland? What will happen if she decides to return to her unhappy life in Montana. Tomorrow is Christmas Day……perhaps magic will happen. I did not expect to love this book as fantasy is not my favorite genre, but I thoroughly enjoyed this book and highly recommend it to lovers of fantasy, Christmas stories, and those who like to see the glass half-full. Hope that this one will be a helpful suggestion!